What Secret Commitments Have California’s Gubernatorial Candidates Made? What kinds of agreements has the next governor of California made with interest groups that sway decisions in the state Capitol? The answers lie in a raft of secret questionnaires that candidates complete as they seek endorsements from a range of groups that will lobby them after they’re elected—and remind them of what they committed to before they won. Labor unions, environmentalists and associations that advocate for gay rights, police and charter schools are among the dozens of groups that have endorsed candidates in the governor’s race. Such seals of approval can come with infusions of campaign cash and help politicians raise their profiles as they seek votes across an enormous state. Public endorsements can serve as a helpful signal to voters, giving a sense of the candidates’ alliances and priorities. But what many voters don’t realize is that the endorsements are more than a sign of affection. They are the result of private concurrence between groups that represent narrow interests and candidates competing to represent the public. 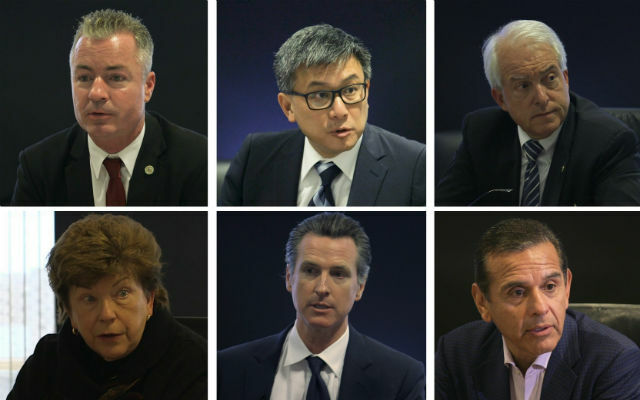 CALmatters asked the six major candidates for governor—Democrats Gavin Newsom, Antonio Villaraigosa, John Chiang and Delaine Eastin, and Republicans John Cox and Travis Allen—to share the questionnaires they’ve completed in seeking endorsements for the June 5 primary election. None did. We also asked several interest groups to share the candidates’ answers. They wouldn’t. The style of the questionnaires varies, with some requesting thoughtful explorations of policy issues and others listing pages of yes/no questions. Some include a “pledge” section—for example, asking candidates to sign their names and promising to “actively and publicly support” workers organizing a union. In some cases, the result is private covenants on such questions as: Will you ban fracking? Limit the growth of charter schools? Support tougher punishments for repeat criminals? Maintain the pension system for government employees? Getting the answers in writing helps interest groups get what they want after politicians are elected. “If we are lucky enough to endorse the candidate that wins the office, it’s a good place to point back to and a level of accountability for what they said when they were running,” said Jim Araby, executive director of the state’s United Food and Commercial Workers union, which endorsed Newsom. Its members include grocery-store clerks confronting technological advances that threaten to wipe out jobs, as well as competition from online vendors that are not unionized. If Newsom is elected and then makes decisions that contradict what he told the union during the endorsing process, Araby said, he wouldn’t hesitate to pull out the questionnaire. “We would have that as a point of reference in any conversation we had with him and his staff. Our union is not afraid to hold people accountable, Democrats or Republicans.” Two years ago it funded a campaign to oust a Democratic assemblywoman after she voted against the union on two bills. In declining to make any of his completed endorsement questionnaires public, Newsom said the forms don’t allow for the nuances that answers deserve. “I’d rather give you the raw, unvarnished, actual answers that do more than just three sentences that can be taken out of context in a questionnaire,” Newsom said during an interview with CALmatters. He and the other five major candidates each sat for lengthy interviews with CALmatters journalists, going into depth on numerous public policy questions. But none would disclose the forms they’ve completed, saying they’re doing plenty to communicate their positions to voters publicly. Many lobbying groups say keeping the answers out of the public eye allows candidates to be more candid. “We think that if they have to worry about us taking it to the press, sharing it around with people, using it in ways that they wouldn’t feel comfortable with, it may have a chilling effect on the amount they would be willing to share,” said Gary Borden, executive director of the political advocacy arm of the California Charter Schools Association. Charters—public schools that do not have to follow all of the same regulations as traditional campuses—have become a big player in the gubernatorial race. The charter association has endorsed Villaraigosa, who clashed with teacher unions and took control of several low-performing schools when he was mayor of Los Angeles. Charter supporters have already poured $10.2 million into a fund paying for ads supporting Villaraigosa. The questionnaire may not be the only factor in an endorsement decision. Like most influential groups, the charter schools association also interviews candidates to discuss issues in greater depth. But its questions indicate some key priorities, asking whether candidates support changing the formula for funding schools, limiting charter-school expansion or applying a conflict-of-interest law that school boards must follow to charters, which are now exempt. Villaraigosa said he’s answered dozens of questionnaires in the course of the campaign and doesn’t see the need to make them public. “All of these groups have asked that they be confidential and… that’s what we’ve done,” he said. Though the charter school group would not disclose candidates’ responses, it shared a blank copy of its three-page questionnaire with CALmatters. Many groups wouldn’t even do that. The Sierra Club, California Teachers Association, Service Employees International Union and California Labor Federation would not provide their blank questionnaires. CALmatters obtained some from other sources. They show that the California Teachers Association asks if candidates will back more regulations for charters, which compete with traditional schools to attract students and the taxpayer funding that comes with them. Many charters employ non-union teachers, an element in the ongoing feud between charter supporters and teacher unions. The teachers association, which endorsed Newsom, also asks candidates if they will oppose using student test scores as an element in determining teacher salaries; support collective bargaining for school employees; and oppose replacing the pension system for public employees with a 401k-style retirement plan. Teachers association spokeswoman Claudia Briggs said the questionnaire is a tool meant to help union members only. The director of Sierra Club California similarly said the group’s members expect their questions and candidates’ answers to be kept private. “We have a policy of not talking about how they respond to the questionnaires because we promised them in advance we won’t do that,” Kathryn Phillips said, noting that the club instead published an explanation of why it endorsed Newsom. Some groups do not use questionnaires—but still pose questions that are hidden from the public. The California Business Roundtable, which includes 30 large corporations, interviews candidates about their positions on health care, budget and energy policy, then sends the answers to the member companies, said president Rob Lapsley. He declined to say specifically what the group asks. Other groups post blank questionnaires on their web sites but will not share candidates’ answers: the Howard Jarvis Taxpayers Association, an anti-tax group that has not yet endorsed a gubernatorial candidate, and the California Police Chiefs Association, which endorsed Villaraigosa. One outlier to the secrecy trend is the National Union of Healthcare Workers, which endorsed Newsom and published its questionnaire with his answers. With groups across the political spectrum interested in holding politicians accountable, why not make the process public? Isn’t it supposed to be voters who wield that power in a democracy? Steve Smith, spokesman for the California Labor Federation, said his group has batted the idea around. As an umbrella organization with many unions that are members, Smith said, the change couldn’t be made quickly. But they’ve discussed moving to a model where the questions—and candidates’ answers—are posted online for the world to see.